WASHINGTON (CN) – Reportedly a finalist to take Justice Anthony Kennedy’s seat on the Supreme Court, Sixth Circuit Judge Ray Kethledge has earned a reputation as an experienced judge who could receive a modicum of bipartisan support if President Donald Trump calls his name next week. 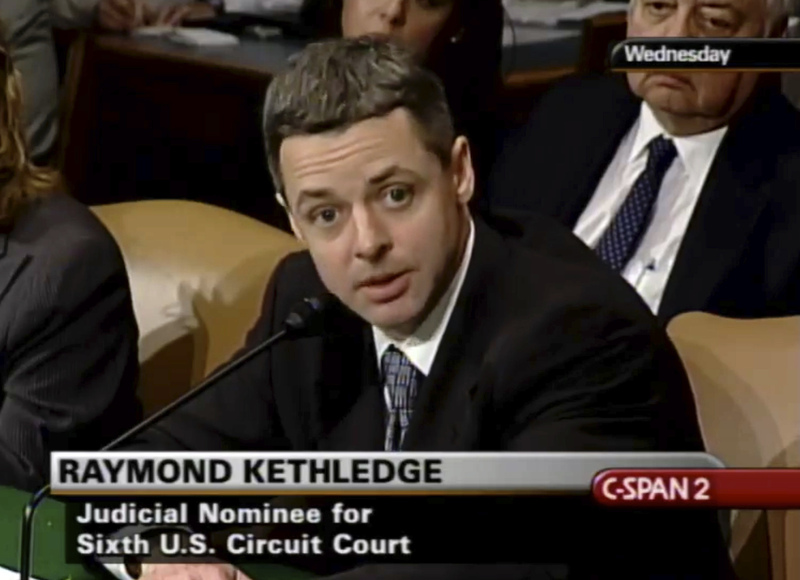 Kethledge has served on the Sixth Circuit since 2008, having been appointed to the court by then-President George W. Bush. Kethledge clerked for Kennedy on the Supreme Court and worked as counsel to former Sen. Spencer Abraham, R-Mich., from 1995 to 1997. A graduate of the University of Michigan Law School, Kethledge would be the only sitting Supreme Court justice without an Ivy League degree. Elizabeth Slattery, a legal fellow at the Heritage Foundation, said Kethledge stands out on the Sixth Circuit for his well-written and accessible opinions, a quality he shares with Trump’s first choice for the Supreme Court, Justice Neil Gorsuch. Though Kethledge does not have as lengthy a history of weighing in on particularly contentious issues as fellow reported finalist D.C. Circuit Judge Brett Kavanaugh, he has written several opinions on matters of national relevance. Kethledge authored an opinion in a 2016 case involving the IRS’ refusal to release documents in a case brought by conservative political groups that claimed the agency targeted them for greater scrutiny when applying for tax-exempt status. The Sixth Circuit held the agency needed to turn over the documents, with Kethledge chastising the IRS for its obstinance in discovery proceedings before a lower court. Kethledge also authored the decision the Supreme Court overturned last month in its landmark Fourth Amendment case Carpenter v. United States. In his opinion, Kethledge wrote the government did not need a warrant to seize cell-site information from the wireless carrier of a man accused of being involved in a string of robberies. Citing Supreme Court precedent, Kethledge determined that because the records came from a third party, the defendant’s privacy interests were diminished, especially considering that the records did not include the content of any calls. The Supreme Court found otherwise, determining in a 5-4 decision in June that police generally need to get a warrant before receiving such information. Michael Moreland, a law professor at Villanova University, said while it is clear from Kethledge’s record that he would be a conservative justice, his limited opportunities to weigh in on some of the hottest legal questions of the day make it difficult to say just what kind of conservative he might be. “From all indications and from his background and his writings and his opinion he’s a conservative, but how conservative or how deeply committed say to orginalism as a method of constitutional interpretation, I think that’s at least up until now an unknown,” Moreland said in an interview. As evidence of Kethledge’s originalist streak, Moreland pointed to an article Kethledge penned last year in the Vanderbilt Law Review in which the judge detailed his experiences hearing cases involving administrative agencies. An adaptation of a speech he gave at the University of Michigan, Kethledge in the article praised textualism and argued many judges are too quick to stop digging into the language of a law to determine its true meaning. He wrote that “there is nothing so liberating for a judge” as finding a law ambiguous, but cautioned judges to do so carefully. Kethledge applied this to several of his own cases, offering detailed reflections on how he went about parsing the language in the statutes at issue. He also extended his argument to the so-called Chevron deference, a judicial doctrine that holds courts should defer to agencies’ reasonable interpretations of their own statutes when those statutes are ambiguous. Kethledge said those ambiguities are not as common as judges make them seem. In the article, Kethledge said Chevron gives agencies “a palpable sense of entitlement” in court, noting that agencies are often seeking a “colorable interpretation that will support the policy result that the agency wants to reach” when they interpret their own statutes. If Kethledge is Trump’s choice, Moreland noted the judge’s ties to Michigan could make his confirmation process slightly smoother, as the state’s two Democratic senators could face pressure to support a man known to retreat to a cabin in the northern part of their state. This, coupled with his relatively limited embrace of conservative legal philosophy, could make the White House’s job easier as the confirmation fight ramps up going into the fall.